We Americans love sweet corn - our uniquely national vegetable. 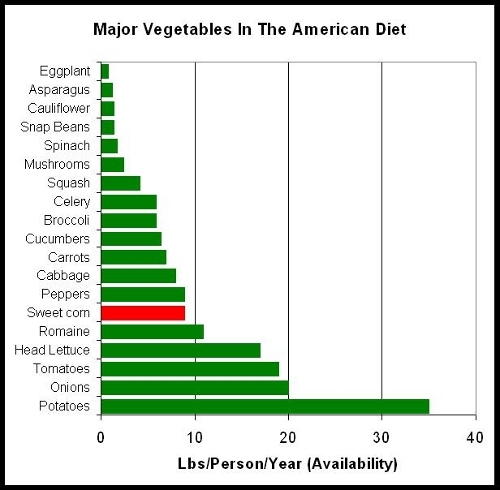 We consume ~9 lbs of sweet corn per person per year (see how that compares to other vegetables in the graph above). The farmers that grow this crop for us do so on a much more local basis than for most fruit or vegetable crops. There are significant sweet corn acres in 24 states and a total of >260,000 acres nation-wide for the fresh market and >300,000 for canned and frozen corn (see graph below). 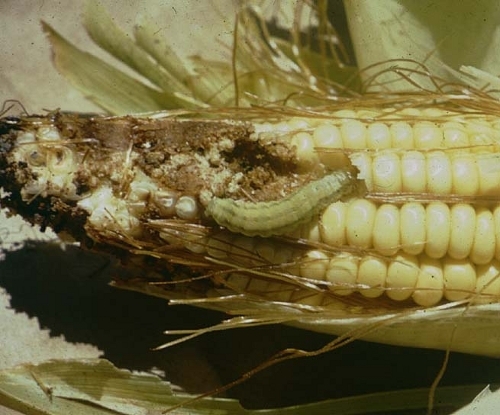 Sweet corn can be difficult to grow for many reasons, and is often sprayed with insecticides. A biotech solution to this problem exists, but it is under-utilized, in part, due to campaigns by anti-GMO activists. In the end, the people most hurt by this are the American sweet corn growers. As popular as sweet corn is, growing this crop is extremely challenging for the farmer. There are lots of pests that love corn as much as we do - particularly the caterpillars (see picture below.) Farmers must spray the crop over and over again in order to deliver undamaged ears. At best a grower might need to make ~4 insecticide sprays/season. In some areas it can require 20 or more! One reason why so many sprays may be necessary is that the spray only does any good while the caterpillars are still outside of the corn plant. Once they get inside, they have an easy meal. All this insecticide use isn't a consumer issue. Because the corn is husked, the USDA pesticide residue analysis of sweet corn almost never finds any detectable residues (even the misleading "dirty dozen list" says sweet corn is cool). The environmental impact of the spraying is closely regulated, but a reduced spray program would further mitigate that risk. For the farmer, however, the pesticide applications are a major headache, cost, and source of soil compaction because of the tractor trips. It is also hard for farmers to plant more than one or two staggered crops of sweet corn because the later crops are subjected to too much insect pressure. Back in 1999, the ag technology company Syngenta began to offer a biotech, insect resistant option for sweet corn - corn that makes its own Bt protein. This protein is a natural, highly selective pesticide for the control of caterpillars (a protein that has been used on organic and conventional crops for >50 years.) This attracted very little public attention. Some of this Bt corn has been used in the Eastern US roadside market, but even though many growers would have loved to plant this corn, there were subtle messages from retailers discouraging them from doing so. Late last year, another biotech sweet corn option from Monsanto was approved by regulators. This unleashed a predictable firestorm of anti-GMO activity. Even after 16 years of commercial biotechnology planting without health effects, and an impressive collection of independent safety data, the automatic opposition to the technology continued without a thought about how it affects the farmer. Anti-GMO activists put pressure on retailers knowing that their need for brand protection will easily trump any concern for the farmers - in spite of pledges for local sourcing. Certain chains immediately took the easy course and said they would not purchase biotech sweet corn. Walmart has now become the main focus of the anti-GMO sweet corn effort. Of course the only real losers in this scenario are the farmers. They could have had the option to grow the crop with far fewer sprays, but with all the flap, they will hesitate. There will probably be very little GMO sweet corn again in 2012, and the anti-GMO camp will declare victory as they have done with potatoes and wheat in the past. I've read dozens of missives on this subject from anti-GMO groups and not one has ever even broached the idea of how the technology could benefit exactly the sort of seasonal, small scale, local farmers they claim to support. (Read a farmer's perspective here). Why Were There Ever GMO Sweet Corn Options In The First Place? It is actually quite unusual for a crop as small as sweet corn to be genetically engineered. The cost of going through the development and regulatory process makes that too expensive for all but a few crops. The only reason that biotech sweet corn was ever even offered as an option is its history. Corn was, of course, a crop that began in the Americas. It was domesticated by the inhabitants of Mexico 14 thousand years ago from a wild species called Teosinte that doesn't even look like modern corn. Later American corn farmers found that if you picked this "field corn" when it was immature, it was a sweet, tasty treat. The problem was, as my grandfather always said, you had to have the water boiling to cook it before you picked it, because the sugar was quickly converted to starch. In the 1980s, two mutations of corn were found that allowed it to become more than a farmer's or gardener's option. One stopped the conversion to starch so the corn would stay sweet long enough to get it to stores. The other made the kernels more tender. 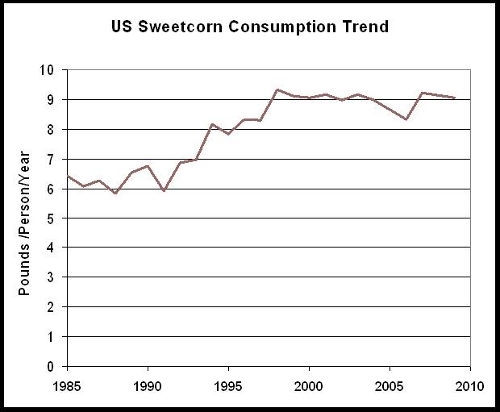 Once these had been bred into the, now "heirloom" varieties like "Illini Extrasweet," the commercial sweet corn business grew significantly (see graph below). People worry unnecessarily about "genetic contamination," from GMO crops, but the truth is that plants (like animals) can only make genetic crosses with extremely closely related organisms. Sweet corn is still the same species as field corn, so the companies that went through all the expense to generate and register GMO field corn lines were able to "back-cross" those traits into sweet corn at a practical cost. That is really the only reason that such a relatively minor crop ever became a candidate for biotechnology improvements. That artifact should have been a great boon to sweet corn farmers, but the most likely scenario is that "food movement activists" who think they are battling with corporations are actually just denying mostly small-scale, local farmers a way to make their job easier. They are trying to enlist you, the consumer in that effort. Whose side will you choose? The farmers or the activists? Will you even get the option to "vote" or will activists simply prevail again? Thanks Eleanor. Writing this made me hungry for sweet corn so we had some last night! "This unleashed a predictable firestorm of anti-GMO activity. Even after 16 years of commercial biotechnology planting without health effects, and an impressive collection of independent safety data"
GMO science is great but the health risk of it is worst, maybe in some other things GMO might work well but not in products that people consume. exactly what health risk are you talking about. I think it is an imagined one. Ditto Steve to Christine: Trillions of servings of GMO foodstuffs have been dished out to millions of consumers worldwide for roughly a generation now with not so much as a bellyache reported. Yes Christine, please cite some cases in which GMO foods has caused illness. I'm all ears. The so-called threat is indeed imaginary.